In development circles, there is now widespread consensus that social entrepreneurs represent a far better mechanism to respond to needs than we have ever had before--a decentralized and emergent force that remains our best hope for solutions that can keep pace with our problems and create a more peaceful world. David Bornstein's previous book on social entrepreneurship, How to Change the World, was hailed by Nicholas Kristof in the New York Times as "a bible in the field" and published in more than twenty countries. 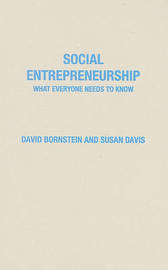 Now, Bornstein shifts the focus from the profiles of successful social innovators in that book--and teams with Susan Davis, a founding board member of the Grameen Foundation--to offer the first general overview of social entrepreneurship. 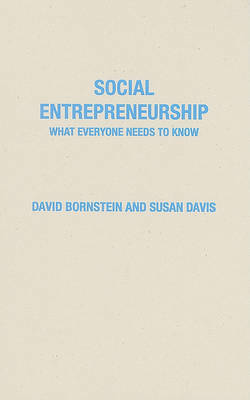 In a Q & A format allowing readers to go directly to the information they need, the authors map out social entrepreneurship in its broadest terms as well as in its particulars.Bornstein and Davis explain what social entrepreneurs are, how their organizations function, and what challenges they face. The book will give readers an understanding of what differentiates social entrepreneurship from standard business ventures and how it differs from traditional grant-based non-profit work. Unlike the typical top-down, model-based approach to solving problems employed by the World Bank and other large institutions, social entrepreneurs work through a process of iterative learning -- learning by doing--working with communities to find unique, local solutions to unique, local problems. Most importantly, the book shows readers exactly how they can get involved. Anyone inspired by Barack Obama's call to service and who wants to learn more about the essential features and enormous promise of this new method of social change, Social Entrepreneurship: What Everyone Needs to Know (R) is the ideal first place to look.What Everyone Needs to Know (R) is a registered trademark of Oxford University Press. David Bornstein specializes in writing about social innovation. He is the author of The Price of a Dream and How to Change the World, which has been published in 20 languages. His articles have appeared in the Atlantic Monthly, the New York Times, and many other publications globally. He co-wrote the PBS documentary "To Our Credit." He is the founder of Dowser.org, a Web site devoted to uncovering stories of change. He lives in New York City. Susan Davis is a thought leader in international development and civil society innovation. She is a founder and current President & CEO of BRAC USA, a newly created organization to support BRAC's global expansion to Africa and other countries in Asia. In addition she was a founding board member and Chair of the Grameen Foundation and current board member. She also serves on the international board committee that selects Ashoka Fellows and is a mentor and coach for the NYU Reynolds Program in Social Entrepreneurship.